Recommended to: Readers who have previously joined Penn Cage on his journey to pin down the Double Eagles. 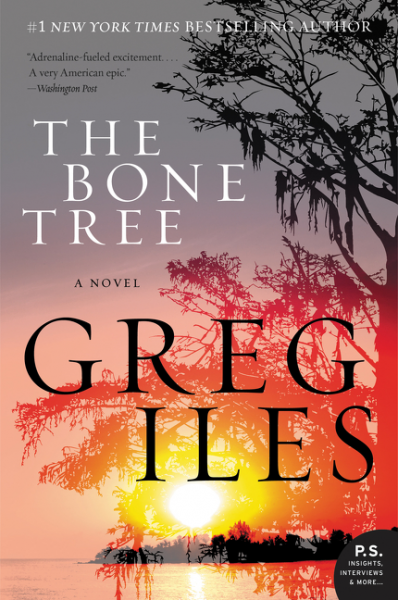 #1 New York Times bestselling author Greg Iles continues the electrifying story he began in his smashing New York Timesbestseller Natchez Burning with this highly anticipated second volume in an epic trilogy of blood and race, family and justice. I finished Natchez Burning with sense of excitement over what was to come. Iles ended that book on a high note, with the kind of climax that leaves you breathless. I couldn't wait to see what Penn would find himself involved in once I started The Bone Tree. I admit that I've found a bit of a soft spot in my heart for Penn Cage and his little family. They have so much passion for doing the right thing, even when it's dangerous, that it's intoxicating. So, it was a little disappointing that I didn't love this book as much as the first. I didn't feel that same sense of urgency, where I had to read at a rapid pace to keep up with the action. Where I praised the first book for avoiding the dreaded info dump, The Bone Tree didn't seem to take that same road. While the premise here is fascinating, tying all the way back into the JFK assassination, the only way to keep that story line going is to throw down a ton of historical knowledge. There are dense portions of explanation into histories of past characters, and how they tie into the ones we are dealing with today. It does slow things down. Now, on a happy note, there's definitely the same amount of attention to detail that there was in the first book. Newly introduced characters are rich, and have deep history surrounding them. Which comes in handy, especially the further that things delve into the past. Natchez, as well as its surrounding cities, gets the same kind of love that it did before. The setting here has its own kind of special magic, managing to set it apart from the rest of the world in a way. It's like a place set back in time, and it makes for an excellent jumping off point into Penn's newest adventure. The action here is just as fast paced as before, putting Penn and his family in the face of danger at every turn. I swear, I've never simultaneously wanted to cheer on and punch a character as often as I have during these books. There are some decisions made that, had I been able to, I would have smacked some of these characters for. The only downside to this particular book is that some of the action feels forced. Like it was put there simply to pick up the pace after a long dialogue or back story portion. The Bone Tree flowed, but just not as beautifully as its predecessor. So, it comes down to the fact that I think The Bone Tree suffers from "middle book syndrome". It's the mid point in this particular story arc, and there's a lot packed into it because of that. It just unfortunately doesn't read as smoothly as the first in the series. The good news is that there's enough here, and the ending is solid enough, that it doesn't keep me from wanting to move on with the series. I'm still really excited to see what happens next.